Ethiopia, officially known as the Federal Democratic Republic of Ethiopia, is a country located in the Horn of Africa. It is bordered by Eritrea to the north and northeast, Djibouti and Somalia to the east, Sudan and South Sudan to the west, and Kenya to the south. With over 100 million inhabitants, Ethiopia is the most populous landlocked country in the world, as well as the second-most populous nation on the African continent after Nigeria. 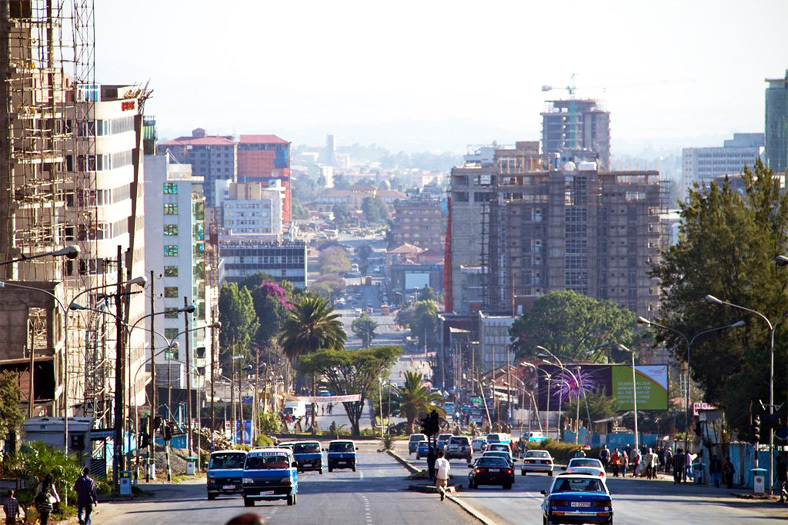 It occupies a total area of 1,100,000 square kilometers (420,000 sq mi), and its capital and largest city is Addis Ababa. Ethiopia is a land of enormous diversity and as a result Ethiopia has more than 80 languages and over 200 dialects. Amharic or Amharigna is the official language of Ethiopia although the government encourages local languages to be taught in schools. The working languages of the national/regional governments may differ according to regions. Other main languages include Oromigna and Tigrigna. English, French, Italian and Arabic are also widely spoken. Ethiopia adopted a new constitution that established the Federal Democratic Republic of Ethiopia (FDRE) in 1995.The federal government is responsible for national defense, foreign relations and general policy of common interest and benefits. The federal state comprises nine autonomous states vested with power for self-determination. The FDRE is structured along the lines of bicameral parliament, with the council of Peoples' Representatives being the highest authority of the federal government while the federal council represents the common interests of the nations, nationalities and peoples of the states. Members of both councils are elected by universal suffrage for a five-year term. The Ethiopian economy is dominated by the agriculture and services sectors-with each accounting for about 45 percent of gross domestic product (GDP), leaving only about 10 percent for industry, of which manufacturing accounts for about 6-7 percent. Exports are highly concentrated, with coffee alone accounting for more than 60 percent of the total. Moreover, Ethiopia could hardly be located in the international market for manufacturing exports, having an industrial export share much less than the already minuscule median for Africa. The limited change in the structure of the economy, especially with regard to manufacturing, is partly explained by the low levels of investment flows and the sluggish growth of the private sector, which was too little to affect its historically low share in labor-intensive manufactures. Currently the market information of 700 agricultural products is being served by the Authority. The Authority obtains market information from Addis Ababa and the states of Amhara, Oromia, Tigray and Southern Nations Nationalities and Peoples, the Director said. He added they are working to get information from the remaining states. Overgrazing, deforestation, and poor agricultural practices have contributed to soil erosion so severe, particularly in the Tigray and Eritrea regions, that substantial areas of farmland have been lost to cultivation. Area: 1.2 million square Kilometers Capital: Addis Ababa Environmental concerns: Overgrazing; deforestation; soil erosion; Climate: tropical monsoon with wide topographic-induced variation. The population according to the 2007 Census was 73,918,505. The growth rate is estimated at 3.2% and the current population estimate is now 86 million, of which 46% fall within the 1-14 age range; 51% between 15 and 64; and 3% are over 65. Approximately 17% of the population is estimated to live in urban areas. The major health problems of the country remain largely preventable communicable diseases and nutritional disorders. Despite major progresses have been made to improve the health status of the population in the last one and half decades, Ethiopia's population still face a high rate of morbidity and mortality and the health status remains relatively poor. Figures on vital health indicators from DHS 2005 show a life expectancy of 54 years (53.4 years for male and 55.4 for female), and an IMR of 77/1000. Under-five mortality rate has been reduced to 101/1000 in 2010 and more than 90% of child deaths are due to pneumonia, diarrhea, malaria, neonatal problems, malnutrition and HIV/AIDS, and often a combination of these conditions. Ethiopians are suffering from the lack of basic needs of life, such as food, health care, housing, education, safe and healthy environment. One of the major causes of famine in Ethiopia is due to the drought. 797,500 main telephone lines, 4,288,023 Internet users (2016), 1,000 mm (3 ft 3 3/8 in) gauge of railroad, 1,000 motor vehicles (2007). The independence of Ethiopia was interrupted by the Second Italo-Ethiopian War and Italian occupation (1936-1941). During this time, Haile Selassie appealed to the League of Nations in 1935, delivering an address that made him a worldwide figure, and the 1935 Time Man of the Year. Percent of GDP	0.8% (2015 est.). Currency: birr, GDP (PPP): $144.6 billion, 10.3% growth, 10.2% 5-year compound annual growth, $1,589 per capita, Inflation (CPI): 7.4%, FDI Inflow: $1.2 billion, Agriculture accounted for 46.3% of GDP, 83.9% of exports, and 80% of the labor force in 2006/2007, compared to 44.9%, 76.9% and 80% in 2002/2003, and agriculture remains the Ethiopian economy's most important sector. Natural resources: gold; platinum; copper; potash; natural gas; hydropower Agriculture: maize; sorghum; wheat; teff; livestock and dairy products Industry: small-scale consumer goods; Exports: $3.163 billion; Imports: $10.6 billion.